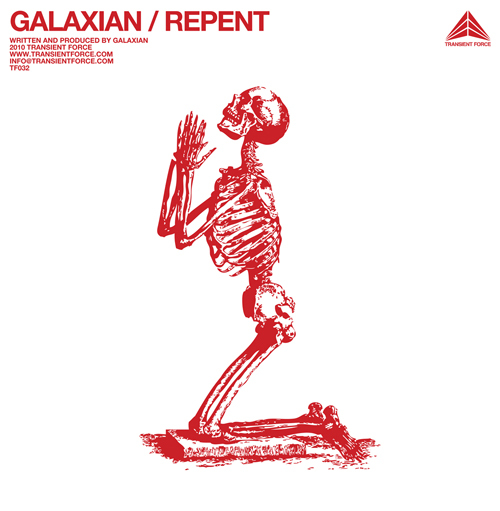 A couple of weeks ago on the hot TRANSIENT FORCE label, GALAXIAN [UK] has released his heavy & illest album entitled “REPENT”. This album features 9 UFO electronic tunes. Beyond the boring expermiental electro and the remakes of classic electro bass, “REPENT” represents an other level of electro/techno music coming from the parallel universe where GALAXIAN is flying. Each tunes are well produced without loose the raw aspect of beat, strange isn’t?…Brillant! The sound is unique, trippy, broken and against odds it’s pretty groovy! Due to his original level of music production, GALAXIAN had to present his official apologies to the aliens and now it’s done with the release of the “REPENT” album.